The Combo Magick plugin automates the creation of combo sequences by reading the controller inputs and converting this data into GPC code. The code optimization is focused in minimize the code size, but ensuring that all events are reproduced faithfully. The algorithm automatically identifies the beginning and end of the sequence of commands executed in the controller. You can include (or exclude) the data from accelerometers and/or DS4 Touchpad. Now also think of the potential here – let’s say you have a modded controller from a company that says their Jitter mod is one of a kind and impossible to copy and no one else has it. 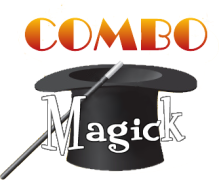 With Combo Magick you can record it and convert to an editable GPC script in seconds!